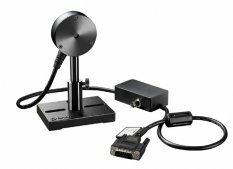 The RM9-PD radiometer is a calibrated sensor for measuring the power of femtowatt CW or quasi CW lasers and light sources. The RM9-PD uses a photodiode sensor in conjunction with an 18Hz chopper (not included, use RMC1 or other chopper). The sensor’s power range is from 300fW (femtowatt) to 300nW (nanowatt). It has an 8mm aperture and covers the spectral range from 0.2µm to 1.1µm.